After a much needed sleep the team of three were refreshed and ready for a full day. All planned out - a morning at the Special Therapy Centre, some local visits and finishing off with a visit to another tuition group. After breakfast there was only a short wait for the first wave of children to arrive. Two vehicles are needed to shuttle all the children from home to the centre, some are able to walk in and others need to be carried. Twenty six children were present and after the 'roll call' and prayers they went to their classes. As one of the rooms normally used was now a temporary bedroom - one group had their class on the veranda. As well as education, the children have therapy to meet their needs. About six or seven had speech therapy and three had physio; the class on the veranda had occupational therapy, including spooning sand, in a sand tray, into small neat piles. Others were engaged in making umbrellas - Chris has ordered ten to bring home and sell to raise funds. Observing the physio sessions, Chris watched a young girl with cerebral palsy practice standing up from a prone position - a very difficult task for her. Speech therapy included identifying fruit off a card and repeating the name. One of the children picked up a bongo drum and then they all wanted a go, a lot of fun. Carol brought out some dresses made by her Soroptimist friends and gave out a few - photographs a plenty. Then it was time for lunch - wow the pickle was hot! At 1.30pm, 8am UK time, the team set off with Philip to meet some local people HHI have either helped or who need help. 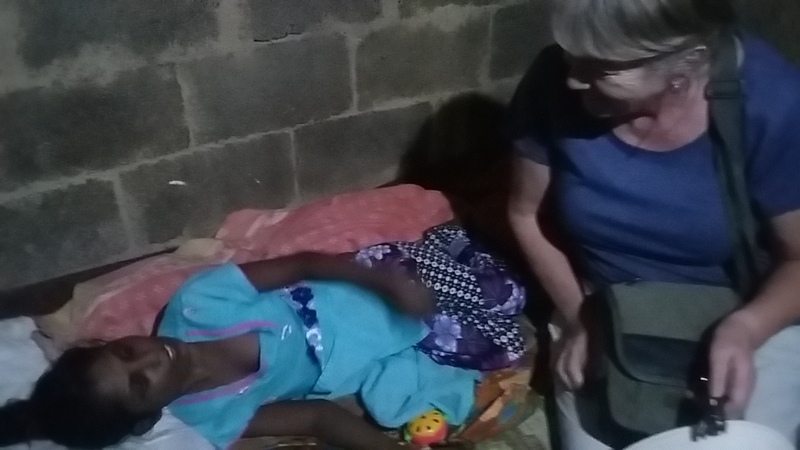 The first call was to meet Sree Deve, an 18 year girl who has Cerebral Palsy and severe mental disabilty and is in bed most of the time (see photograph - Carol comforting Sree). Edmund gave the family 500 rupees which is what HHI has sent out every month since last August. Next they went to see Sathya Das a 52 year old man who had a heart operation (stents) last year and needs another operation to remove gall stones. He needs money for his regular medicines. Edmund left a donation for his next prescription and advised him to see Tom if he needs more help. On then to visit Babu, a blind man (since birth). HHI already help the family every month to cover their rent and buy food. When Edmund asked why she married a blind man, his wife simply replied "God told me too!." Time to stop an rest? Not likely! The team went off to see Sivendrum who had broken his leg and needed a hip replacement. Though the operation was successful the hip area became infected and the artificial hip was removed. Now he has to wait for 6 months, for the infection to clear, before he is given a new hip. Meanwhile he is bedridden. However the team had a conversation about how Sivendrum and his wife Sheetra will earn a living when he has recovered. Altogether Sivendrum has had 8 operations! The final call was a tuition group at Bettei, 15 children were having their lessons when the intrepid three and Philip arrived. As is usual, some of the children sang songs and one sang in English. The older ones stood up and told us their names, grade and favourite subject. Mostly English, one science and others Maths. They each were given an excercise book and a pencil. The team returned back home just in time for dinner - including the third type of Indian bread, oh and some spices! Good night, hopefully will post some more news tomorrow, about our trip to Trivandrum which will include giving out medicines to kidney patients and a bit of 'tourist' time.